The government is trying to bring back fox hunting, please contact your MP now! Tell your MP that you don’t want a repeal by the back door. Click the link below, there is a template letter for you to sign. http://e-activist.com/ea-action/action?ea.client.id=122&ea.campaign.id=26535 – you may personalise and edit, but if this is not possible please just send it as it is. This is an urgent action the vote could take place on Wednesday 26th March so you need to contact your MP immediately and urge him or her to vote against this devious attempt to bring back this hideous cruelty. The hunting act has been in force for nine years, yet it is in danger of amendment unless we can put a stop to this. Despite the fact that the majority of people here in the UK oppose hunting with hounds, the devious Tory government, with no regards as usual to democracy, is doing its utmost to bring back this sadistic pastime. I urge you to contact your MP and get this stopped now! Hunting with dogs for sport has been illegal in England and Wales since 2004. Since that time those who have nothing better to enhance their lives except the hunting and slaughter of a defenceless animal have ceaselessly campaigned to repeal or overturn the ban. “The Federation of Welsh Farmers’ Packs and the Countryside Alliance are pushing for an amendment to the Hunting Act which would allow a full pack of hounds, rather than just two as allowed at present under an exemption, to draw out a fox to a waiting gun. http://www.parliament.uk/get-involved/contact-your-mp/contacting-your-mp/ – Please do e-mail Cameron even if you are not a UK citizen, animal cruelty is the concern of every decent caring person worldwide. If you have any doubt about the sickening barbarity of this so called “sport” or that foxes are thinking feeling sentient creatures much like your dog watch this video. Surely any sane compassionate person would not want to chase this defenceless animal with packs of dogs and watch while the poor creature is torn to pieces. You have to ask what is wrong with people who are so determined to bring back this hideous pastime. What kind of mentality enjoys the brutality, the suffering and death of another living being? Such is the brutality of fox hunting. What a brave women , thankfully there are still caring people in this word who value the lives of the other animals with whom we share this world. Animals who are sentient creatures, who suffer as we do, who fear death and wish to live. Is David Cameron trying to bring back fox hunting? I know it is rather late now for this, but I am not a professional writer and some things take a lot of research. Besides is it ever too late to pay a tribute to someone who has accomplished so much. Researching the life of Tony Benn I have learnt so much about this remarkable man who will be sadly missed in these challenging times. Toney Benn was a man of honour, principle and integrity, a passionate campaigner for social justice, genuine democracy, freedom of speech, human rights, trade unionism and compassion towards animals. He was also an advocate for pacifism and a fervent campaigner for the cessation of all wars. 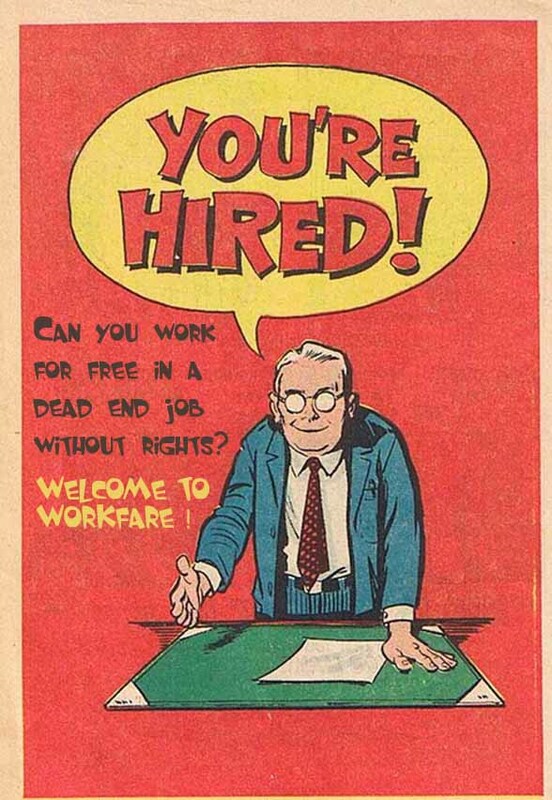 The People’s Assembly Against Austerity was launched – by Tony Benn, Len McCluskey and other trade union leaders – with a call to all those millions of people in Britain who face an impoverished and uncertain year as their wages, jobs, conditions and welfare provision come under renewed attack by the government. 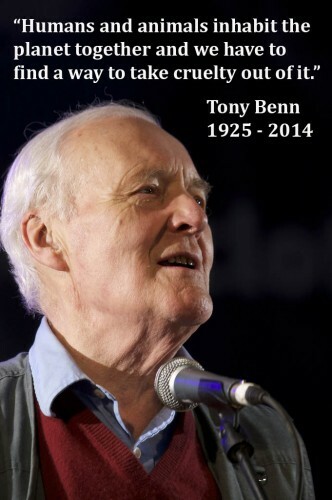 As a tribute I would like to include a selection of notable quotations from Tony Benn. I never liked meat and my son Hilary, 30 years ago, said: “If the world ate the grain instead of feeding it to animals and killing them, there would be enough food for everybody.” That moment my wife and I became vegetarian and I never touched meat since. ‘The case for animal testing is now being directly challenged by scientists and doctors and their judgement must be taken seriously’. This is a very informative interview, not only about Tony Benn’s vegetarianism, but it reveals a lot about the personality and the world-view of this remarkable politician. Interestingly Tony Benn died on exactly the same date as Karl Marx – 101 years later. “I do not share the general view that market forces are the basis of personal liberty”. Robert Henry’s family and friends have started a petition to save his life.Please sign and share. It is also available at the FADP website. Please make a donation to FADP if you are able. The all-volunteer statewide coalition to abolish the Death Penalty must have your help to do the work. Since Robert has been on death row, he has served as a counselor and mentor to those struggling with the addiction issues. Mr. Henry knows the horrific toll of untreated addiction – his crack-cocaine addiction led to his condemnation to death, and the death of Ms. Harris and Ms. Thermidor. If you don’t live in the USA you can still sign the petition and send an e-mail to Governor Scott. Also consider that many people innocent people may well have been executed. Whenever I talk to someone about the death penalty, and my belief that it has no place in society, I’ll come back to innocence a lot. For me, the possibility of executing an innocent person is one of the most compelling reasons to abolish state-sanctioned executions. In the United States, 142 former death row inmates have been exonerated – found innocent of the crimes they were due to be executed for and released – since 1976. That’s one person released for every ten that have been executed. Here in the UK the death penalty was abolished decades ago and also through out the EU . The European Union holds a strong and principled position against the death penalty; its abolition is a key objective for the Union’s human rights policy. Abolition is, of course, also a pre-condition for entry into the Union. Indeed, the EU is the leading institutional actor and largest donor to the fight against the death penalty. This commitment is outlined clearly in the EU Guidelines on the death penalty, the first ever human rights guidelines adopted by Council, in 1998. We campaign for an end to all executions around the world – no matter what the circumstances. Find out the latest on our work to end the death penalty, the ultimate denial of human rights. 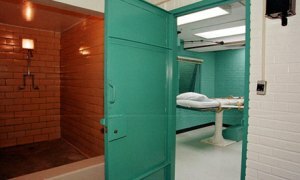 Please sign the petition concerning the execution of Robert Henry and or write an e-mail to governor Scott if you have not already done so. If Robert Henry is executed he will become the 84th person executed in Florida since the death penalty was reinstituted in 1976, and the 14th during Scott’s tenure as governor. Surely it is time for such punishment to stop. Urgent Action – if you don’t live in the UK or live too far away from London to attend you could write to David Cameron and or send him a Tweet, details further down. 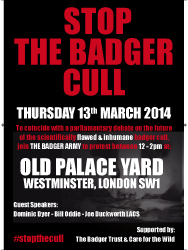 A House of Commons debate to review the future of the badger cull to be supported by a public demonstration. 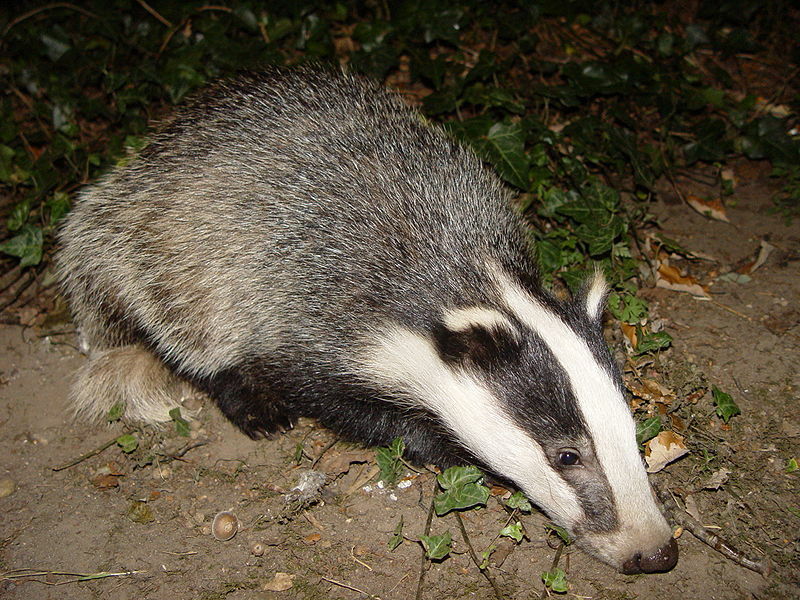 This debate is perhaps the most important badger debate in Parliament, and is absolutely critical in the campaign to stop the badger cull, with the possibility that the Government could announce two new cull zones in early April, initiating the national roll out of the badger cull. Please also write to your MP, details about this can be found further down. “To coincide with an all-day debate on the badger cull on Thursday 13 March, we are going to be attending an anti badger cull Demo at Old Palace Yard, Westminster between 12-2pm. League Chief Executive, Joe Duckworth and Wildlife Expert and League Vice President, Bill Oddie will be speaking alongside other high profile anti cull campaigners and MPs. Click the link above to view and download a larger pdf version of the above which you may use as a poster to display in your window or elsewhere. Please try to personalise if possible as individual correspondence gets more notice but if you cannot for some reason please just send either of the above as they are. The government need to be reminded about the strength of public opinion on the matter. The majority of people do not want the cull. I don’t care for the use of the word cull as it tends to mitigate the fact that this is a massacre of innocent defenceless animals. It is barbaric cruel inhumane and totally unnecessary and not worthy of any country that wishes to be considered as civilised. Badgers are a protected species, yet when they are deemed an inconvenience by this callous and undemocratic government it seems they can be murdered regardless. Please take five simple actions to help bring and end to animal experimentation. Please take as many actions as you can, most petitions require a only signature and comments are optional though more effective. Stop the atrocities at the baby monkey lab at the University of Washington and shut it down for good. The University of Washington performs shockingly cruel experiments on monkeys involving the drilling of holes into the skulls of live monkeys and implanting coils on their eyes – I shudder to contemplate the horror of this. Other routine experiments include inducing convulsions, suffocation and torturing babies while still in their mother’s womb causing deformities. Also psychological cruelty, such as tearing baby monkeys from their mothers to study the resulting psychological damage. If after all this sickening abuse the babies survive they are killed at one year of age. Tax payers in the USA paid these vivisectors $18 million between 2010-2011 and another $12 million to other labs to breed baby monkeys. Please help stop these atrocities now. This lab and others like it are nothing more than places of torture for defenceless animals. Please sign the petition and share widely, let’s get this lab shut down and end this appalling treatment of these intelligent sentient creatures. 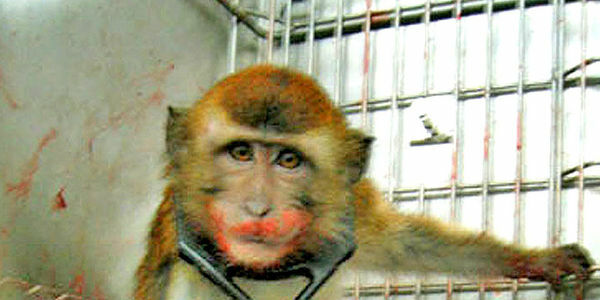 Experiments on living thinking feeling animals are just so horrendous, so cruel, so inhumane, cold-blooded and callous. One has to ask what kind of person conducts such obviously painful experiments on a living being. These monkeys must scream in agony, there can be no denial surely that animals feel pain. Monkeys are highly intelligent creatures who share 99 percent of our DNA. Even if they were not as intelligent, all animals feel pain and experience fear and consequently suffering. Any creature with a brain and any kind nervous system will suffer pain. Of course monkeys are not the only animals who undergo the agony of vivisection, for example here in the UK over 3118 Beagles were used in over 4693 experiments throughout 2012 and thousands were bred specifically for this purpose. One particularly heartbreaking scene shows a tiny beagle puppy who is screaming in distress as a researcher attempts to deliver a lethal injection, but is unable to get a vein because they’ve been so damaged. Please read more and sign the petition. If you use the following link to sign the petition rather than the one included in the second link you will be able to add a comment which is more effective. imaginable – for most sensitive caring people unimaginable. Warning some people may find the following video upsetting. Please watch if you can, this may make you think differently about mice and rats who need our help to bring about an end to their torture as much as monkeys, cats or dogs. Ninety-five per cent of animal experiments are performed on rats and mice. You can help make a difference for these vulnerable animals by urging your members of Congress to amend the Animal Welfare Act to include protection for mice and rats. https://secure.peta.org/site/Advocacy?cmd=display&page=UserAction&id=1720 – scroll down to send an online letter. Please personalise if you can, but send as it is if for some reason this is not possible. I am not sure if only people living in the USA can take part in the above action. Rats and mice are sentient beings, they are mammals like monkeys, dogs and humans; they have a brain and a nervous system so feel pain and suffer like you and I or your pet dog. Such treatment of other living creatures is inexcusable, a crime against a sentient being. What right have humans to torture any creature. Animals exist to live out their own lives in their natural environment, they are not here for our benefit for either our use or abuse. http://www.buav.org/ – “Our vision. To create a world where nobody wants or believes we need to experiment on animals” Lots of action you can take to bring about and end to vivisection. “Such ill treatment of animals does not reflect a civilised society where other species merit respect. The Anti-Vivisection Coalition (AVC) claims animals have died, been seriously injured and mistreated in labs at the North’s leading university. The campaign says documents obtained under the Freedom of Information (FOI) Act reveal rabbits have suffered lacerations, swellings, abscesses, mastitis and obesity, fish have suffered fungal infections and died and vets have expressed concerns over the conditions of rats following surgery. Professor Chris Higgins, the university’s vice-chancellor, said its use of animals in research work is strictly regulated and it strives for the very highest standards of care and wellbeing for all animals. Torture is still torture regulated or otherwise. Durham one of the UK’s least bloodthirsty universities! Tab research reveals that over 1 million animals are killed by British universities every year. This is so shocking in the extreme! Is no animal safe from man. What right have human beings got to murder animals whenever they so please. This is not our world to do with as we wish, we share it with myriad species of animals, it is their world too and they have as much right to live as we do. Indeed it is very similar to the badger cull here in the UK. We will never have a peaceful just world while we mercilessly kill the earth’s other inhabitants. 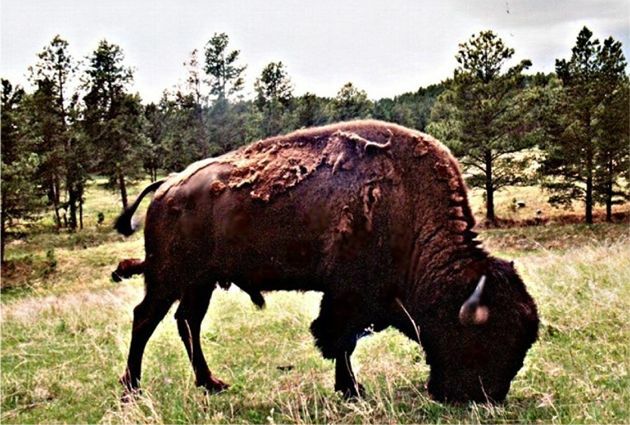 I always thought bison were protected, which of course they should be. But then badgers where protected until the government decided they were an inconvenience and needed to be massacred. A beautiful Bison, still wearing its winter coat, taken many years ago. As some of you may know, I have recently started another WP Blog named tahtonka. It was created for two reasons, one to deflect the often intense pain from frequent postings, (like today’s story) on this Blog and second to reflect my education and passion for Global Culture. Now, in light of that revelation, you can only imagine how reading the stories in my email today has sickened me. May I say, that if you have never been to Yellowstone National Park in Wyoming, you have cheated yourself of an unforgettable experience. One of the many things that make Yellowstone so remarkable, are its beautiful, wild wildlife.